Our peonies were spectacular this year. After lots of transplanting and splitting in past seasons, each bush is getting more established, and we had a beautiful mix of fuscia, blush and white blooms. I don’t usually do cut flowers, but after a bunch of the white peony blossoms proved too heavy for their stalks, I cut them and brought them inside. I don’t do cut flowers because they quickly turn depressing on me. I’m not one to remember to refresh water or pamper my plants. So blooms wilt, stems droop and the flowers look more funereal than fabulous. But with these peonies, I think I beat even my own record. One day–just one day–after bringing them in, a blossom shed every single one of its petals. I scooped the white flakes into the composter and carried on. Three more flowers disrobed the following day. 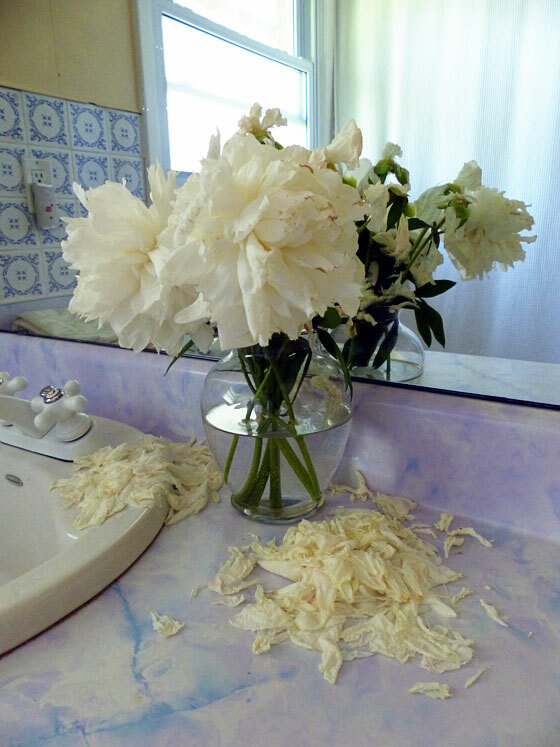 At that point the whole bouquet–or the remains–went in the composter. So lesson learned, I will focus on enjoying the peonies outside and refrain from any further florist failures. And it’s Friday, so I will be spending a lot of time outside this weekend. What do you have on tap for the weekend? 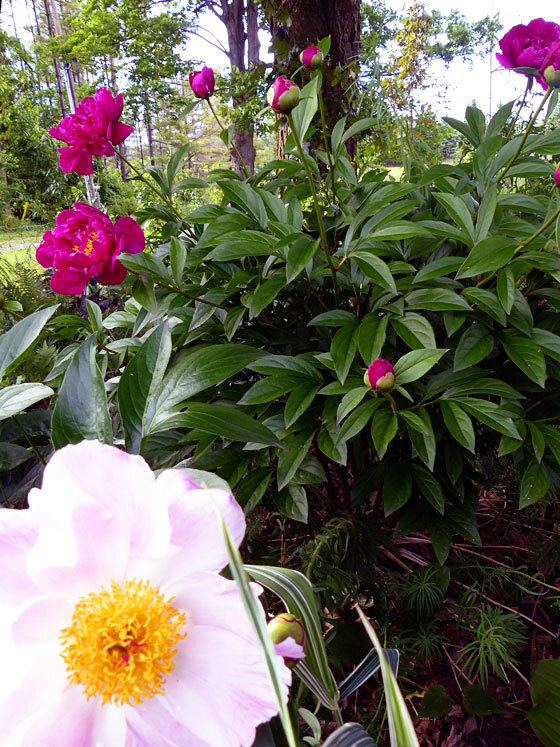 Do you have any peonies either in your garden or in a vase at your house? Peonies are my favourite flower, but are very temperamental and short-lived. If bringing them inside, you need to cut them when they’ve just barely started to open. Once they’ve opened all the way, they only last a day or two (even outside). They are my favourite though, so I keep adding more of them to my gardens! And see, I figured leave them til they’re open so that they get the full benefit of the ants. Good to know. I’ll keep adding them to my gardens too. What’s your favourite colour? I love the shades of pink – as long as they aren’t bordering on red. 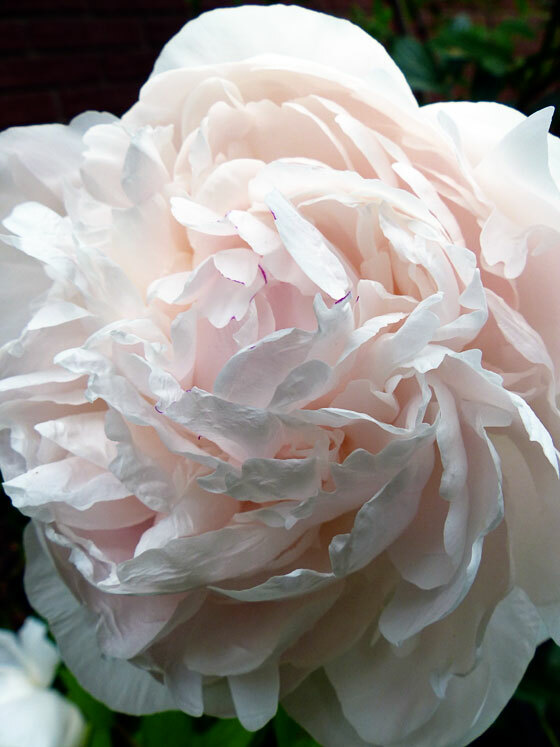 Pale Pink is my favourite – specifically the Sarah Bernhardt. I just googled Sarah Bernhardt. Those are lovely! Such dense petals. I need those in my garden! They’re beautiful, Julia! I love their fragrance! I think this is the first year we had enough blossoms to smell them. Just walking by the flower bed was lovely. They are gorgeous! Wow, that first one is incredible. Ours have yet to bloom – I think it may be another bloomless year. I wonder if they need some more peonies around them? Like a boy and a girl peony type thing. Some plants do. I think this is only its second year, so maybe it’s just too new. We do have fabulous tree peonies. They are a peachy taupe colour, and are just glorious. Like yours however, they faced downwards from their own weight, and died as soon as we brought them in. I don’t know what the solution is. I’ve heard that if peonies are planted too deeply, you only get leaves, not blossoms. I have a few that haven’t bloomed, so I’m planning on elevating them a bit later this summer. If peonies were planted are roots (rather than buying an already growing plant from a garden centre), or if they’ve been moved or split, they can take a few years to bloom. I have one that I planted as a little plant last year, and it isn’t blooming (and not planted too deep – in fact, I think it might have come up out of the soil too much and isn’t planted deep enough). Peonies are sometimes very high maintenance! I had some beautiful peonies at my old house but I don’t have any here. I need to remedy that! My favorite color is the pink ones with cream centers. You definitely need to remedy that! The nice thing about peonies is sometimes people are willing to share them for free.